I wrote bat file which makes download MB files from MSXArchive.nl easier as well as MSX Resource Center to load by MSX emus for reference. Moonblaster is now distributed as OSS and we can use it with a marvelous source codes thanks to original author, but unfortunately original “sample disk” is not included in this archive. To know Moonblaster further, one of the best way is refer good works distributed in MSX Resource Center web site on behalf of the sample disk, I thought. This bat make this sequence easier. There are so many issues to solve, but I make it public. This is english patch for NRTDRV, for dual OPM(YM2151) and single SSG(YM2149)/PSG(AY-3-8910) controllable music driver. It is originally developed for Sharp’s X1, but is ported to other JP PC’s which has OPM options, like X1/X1turbo(with OPM soundboard), X1turboZ(embedded, internal OPM/SSG), MSX(with SFG-01/05), PC88(with Sound board “HIBIKI”). 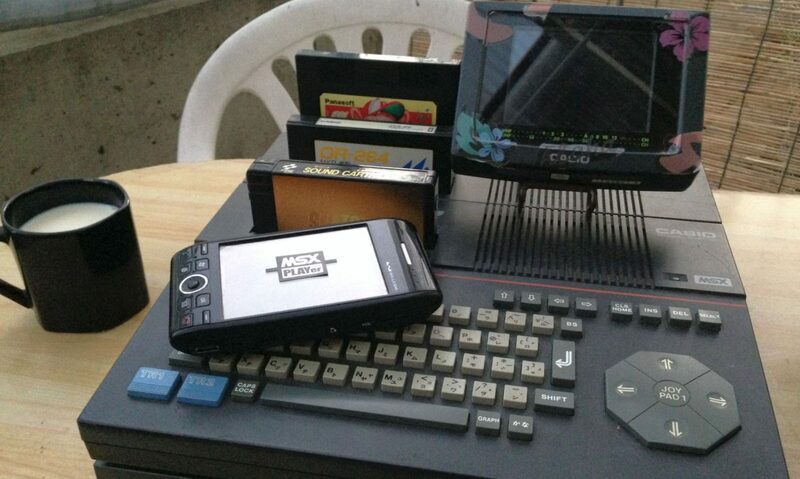 Windows’ or Android’s applications emulates OPM/SSG/PSG well and you can play NRTDRV’s music data on such devices, no need to own rare JP 80’s PCs. Some hardware chiptune modules are supported, like NBVx as well. You can use NRTDRV MML compiler (NRTC) with English messages. MML(Music Macro Languages) was very popular in 80-90’s hobby PCs. It is produced as IPS patch to original Japanese version of NRTDRV.EXE. Now I am working on translating NRTDRV manuals. NRTDRV is originally aimed and developed for Sharp “X1” series computers, which has OPM sound board option was very popular. Highest models of “X1turboZ” has OPM inside and as default. These models were released almost same time as X68000 series, which has OPM as well. NRTDRV developed in 2009, and is not old software at the time of real X1, ’83-around ’89. MML compiler runs on Windows and supports USB-connected hardware chiptune players as well. NRTDRV is OPM(max. 2 chips) + PSG music driver on Sharp X1 series PCs and ported fine to MSX with SFG-01/05, especially for YAMAHA’s line ups. Note, it is important that NRTDRV supports SFG-01 and SFG-05 for MSX, in addition to that, double cartridges of that. Remember, YAMAHA’s OPM(and successor) have been almost vanished options and supported with only few softwares developed by YAMAHA, and it is difficult to get. There are many FM sound related replayers which has origin in Japanese 80’s PCs. NRTDRV official support replayers are “hoot”, “ASLPLAY(CLI)”, “nrdplay” and “MDPlayer”. Many of them supports other sound chips other than OPM and PSG. I want these tools get more popularity among retro sound geeks abroad as well. I am checking NRTDRV related tools whether English mode available or not. I shall translate and make some patches if there are no support in English. Slowly but step by step, translation is prepared. Let us play with it!! 1 Channel MML activity has just started! I have just started “1 Channel MML” activity which makes only plays 1 channel melody and some noise or percussion part music data. This is my memorial first data from Magical Sound Shower(from Out Run/SEGA). I know this is not completed, but I make it public. I use NRTDRV music driver. I suppose, this means “Too many sybols” and memory area is not enough. 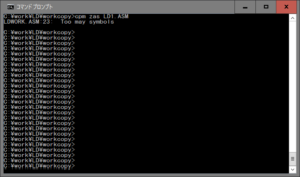 I decided to compress ZAS binary and make free memory. I used PopCOM! execution file compresser on CP/M. It is distributed in “PC88 users club library”. After compression, size of ZAS.COM is 19840 from 37632 bytes. I wanted to solve memory shortage by this with 18k extended free area, but in vain. 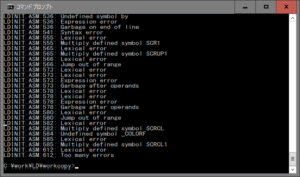 “Too many symbols” error is not resolved by memory free area.